Unknown: Why he couldn't have stayed this tiny. Ever wondered about the riveting national secrets regarding the delicate nature of panda diplomacy? Drat. Well, regardless, The Washington Times dishes up a behind-the-scenes look at the State Department's efforts to extend Tai Shan's stay in the U.S.
Back in late 2009, we were the facing impending grief over the American-born panda's expected departure. Around that time, President Obama and Chinese President Hu Jintao just happened to have meetings scheduled. Hmm, convenient. Before those meetings, a State Department official sent an email to National Zoo officials. The subject? A last-ditch effort to extend Tai Shan's stay, by taking their plea for help all the way to the Oval Office. 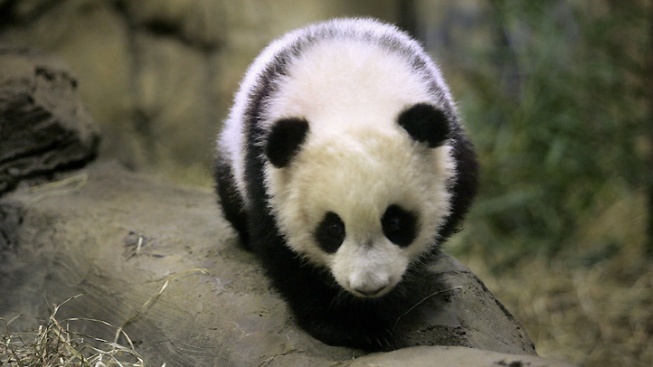 "If President Obama were to mention the National Zoo's request to extend Tai Shan's stay to at least late 2010 (or even later) to President Hu during one of his discussions, we think there might be a good chance that President Hu would agree, purely as a diplomatic goodwill gesture," the State Department official wrote from the U.S. Embassy in Beijing, according to emails obtained through the Freedom of Information Act. Other documents show that officials discussed how getting Tai Shan to stay in Washington might even help U.S.-Chinese relations. It's not clear whether the State Department ever approached Obama about the plan. What is clear, of course, is that Washington collectively cried into its very large hankie on a cold, cold morn in February 2010 when Tai Shan got a move on to his new home in China.